Hironobu Sakaguchi (坂口 博信, Sakaguchi Hironobu) (born November 25, 1962) is a Japanese video game designer, director, producer, writer, and film director. He is best known as creator of the Final Fantasy series, which he conceived the original concept for the first title Final Fantasy and also directed several later entries in the franchise, and has had a long career in gaming with over 100 million units of video games sold worldwide. He left Square Enix and founded a studio called Mistwalker in 2004. Sakaguchi was born in Hitachi, Ibaraki, Japan. Originally planning to become a professional musician, he played in various bands and booked local concert venues during his secondary education, selling tickets to the concerts himself. Sakaguchi studied electrical engineering while attending Yokohama National University, but dropped out in 1983 mid-semester with Hiromichi Tanaka. During university, Sakaguchi's programming studies led him to desire the new Apple II computer which had recently been released. Since he could not afford one, he instead purchased a knockoff in the Akihabara district, which, although cheaper than an actual Apple II, was still expensive. Realizing that he needed funds to buy software for his computer, he began to seek a part-time job to earn the necessary income. This search then led to Sakaguchi becoming a part-time employee of Square, a newly formed branch of Denyūsha Electric Company founded by Masafumi Miyamoto. At this point, Sakaguchi still dreamed of becoming a professional musician, but felt that working for a company like Square would provide him with needed programming experience in the meantime. When Square became an independent company in 1986, Sakaguchi became a full-time employee as the Director of Planning and Development. After working on several Nintendo Entertainment System (NES) games that failed to become major hits, Sakaguchi began questioning if he had chosen the right career path and if he was qualified to be a game writer. He then pitched the concept for a role-playing video game called Fighting Fantasy, and assembled a small team to realize this project of his. Among others, Sakaguchi's thoughts about quitting the game industry and going back to university – had the game not sold well – were a reason for the title being changed to Final Fantasy. The game was released in Japan for the NES on December 18, 1987, and was successful across Japan. Under Sakaguchi's supervision, Final Fantasy developed into an expansive franchise, spanning from stand alone stories to spin-offs to direct sequels. In 1991, following the release of Final Fantasy IV for the Super Nintendo Entertainment System, he was honored with the position of Executive Vice President. The last Final Fantasy game he directed was Final Fantasy V, becoming the producer for future installments of the franchise. In 1995, he became president of Square's North American division. His final role as game producer was for Final Fantasy IX. In an interview at the time he described it as his favorite Final Fantasy. He later went on to serve more as an executive producer of the series, as well as many of Square's other games, including Vagrant Story, Parasite Eve and Kingdom Hearts. The Kingdom Hearts series would later go on to feature a character named Master Eraqus, who was designed to physically resemble Sakaguchi and match with Disney's Yen Sid. In May 2000, Sakaguchi received the Hall of Fame Award of the Academy of Interactive Arts & Sciences. A long time proponent of bringing together the story-telling vehicle of film and the interactive elements of games, Sakaguchi took the leap from games to film when he made his debut as film director in Final Fantasy: The Spirits Within, an animated motion picture based on his world-famous Final Fantasy series. Despite some positive reviews, the film was a box office bomb, losing approximately 94 million dollars. Sakaguchi founded Mistwalker, which began operation in 2004. In February 2005, it was announced that Mistwalker would be working with Microsoft Game Studios to create two role-playing video games for the Xbox 360. Still, the company remains independent from console exclusivity. Sakaguchi released the works Blue Dragon in 2006, and Lost Odyssey in 2007 on the Xbox 360, and ASH: Archaic Sealed Heat on the Nintendo DS. He was developing an action-RPG, titled Cry On, until the project was canceled in December 2008. Later he began working on a new "large scale project" on which Sakaguchi commented: "I'm betting a lot on this project." This game was announced in January 2010 to be The Last Story, a co-production with Nintendo for the Wii. It was revealed in an interview on Nintendo's website that Sakaguchi is the director of The Last Story, which marks his first time as director of a game since Final Fantasy V.
In 2016, he announced the formation of a new video game development company located in Tokyo. The proposed name of the studio is "Dawnwalker". Hironobu Sakaguchi has been credited, in some capacity, with the following games. ^ a b c Parkin, Simon (January 2018). ""Never-Ending Story: The Untold Legend of the World's Greatest RPG"". Edge. 314: 56–91. ^ Castaneda, Karl (March 5, 2006). "Sin & Redemption 6". Gaming Vision Network. Retrieved April 14, 2013. 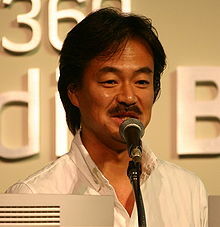 ^ a b c d "Hironobu Sakaguchi/Chairman and CEO". Square USA. Archived from the original on May 11, 2000. ^ a b Gifford, Kevin (2011-12-21). "Hironobu Sakaguchi on Final Fantasy I's Roller-Coaster Development". 1UP.com. Archived from the original on March 28, 2016. Retrieved 2013-09-02. ^ a b Fear, Ed (2007-12-13). "Sakaguchi discusses the development of Final Fantasy". Develop. Intent Media. Archived from the original on 2011-08-05. Retrieved 2008-10-16. ^ a b "『FF』はどのように世界に広がっていったのか？　坂口博信氏と浜村弘一ファミ通グループ代表が"国際日本ゲーム研究カンファレンス"にて語る". Famitsu. 2015-05-24. Archived from the original on 2015-05-26. Retrieved 2015-05-29. ^ Kohler, Chris (2009-07-23). "Why's It Called 'Final Fantasy'? Uematsu Explains". Wired. Retrieved 2013-09-02. ^ "Interview with Hironobu Sakaguchi". IGN. April 5, 2000. Retrieved February 14, 2010. ^ Duffy, James (August 2, 2006). "Movies that were Box-office Bombs". Boston.com. Retrieved January 2, 2010. ^ "1UP.com". 1UP.com. December 25, 2008. Archived from the original on January 6, 2010. Retrieved July 20, 2010. ^ "レゴ – mistwalker". Archived from the original on July 20, 2010. Retrieved July 20, 2010. ^ Luke Plunkett (January 29, 2010). "Final Fantasy Creator Working On Wii Game". Kotaku. Retrieved January 29, 2010. ^ Jarvis, Matthew (June 21, 2016). "Final Fantasy creator Hironobu Sakaguchi set to open new development studio". Develop. Retrieved July 12, 2016. ^ "MobyGames.com". MobyGames.com. Retrieved July 20, 2010. ^ "The Making Of... Final Fantasy VI". Edge. Future Publishing (251): 124–127. March 2013. ^ V-Jump Festival 1994 (VHS tape). Japan: Shueisha. 1994. Wikimedia Commons has media related to Hironobu Sakaguchi.